The V. Rev. Archimandrite of the Ecumenical Throne Dr. Damaskinos Alazrai was born in Kuwait City, Kuwait. In 1991, he returned to his country, Jordan where he lived in the city of Al Huson (Northern Jordan) until the age of 16. After he completed his middle school, he left to Greece and completed his High School education at the Ecclesiastical School of Holy Monastery of Archangels in the city of Xanthi. In April 2008, with the blessings of his Beatitude Eronimus, the Archbishop of Athens and all Greece he became monk and was given the name Damaskinos. A few months later, in July 2008 he was ordained Deacon, at the Church of Saint Marina in “Ilioupoli” in Athens. 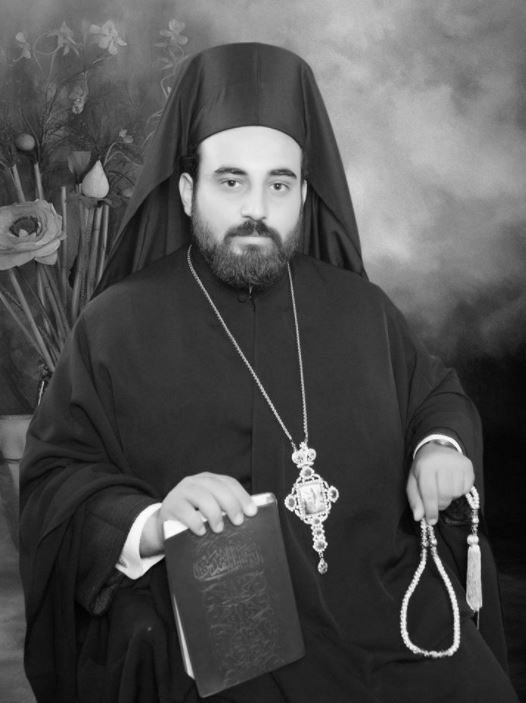 In December 2009 he was elevated to Archdeacon of the Holy Diocese of Didymoticho in northern Greece “Holy Metropolis of Didymoticho Orestiada and Soufli”. He was appointed the head of the office of His Eminence Metropolitan Damaskinos and the deputy of the convent “birthplace of the Virgin Mary” in the region of Dadia (northern Greece). In December 2011 he was ordained priest and was given, the same day, the rank of Archimandrite as well as the rank of spiritual father. He became the spiritual leader of the “Cathedral of the Blessed Virgin Mary the Eleftherotria”, the spiritual leader of the Cathedral Church of the Archdiocese of Didymoticho, the church of St. Athanasius the grate, in parallel to his administrative position in the diocese of the region. In December 2014, he was promoted to Archimandrite of the ecumenical Throne, by placing the hand of His Holiness the Ecumenical Patriarch Bartholomew upon him. He Served in the city of Cairo, during the years 2014 and 2015, at the request of His Beatitude the Patriarch of Alexandria and the rest of Africa Theodorus II. In the year of 2015, with the blessings of the Holiness of the Holy Patriarch Ecumenical Patriarch Bertolomaeus and His Eminence the Archbishop of America, Dimitrius, he traveled to the United States of America, in order to serve the members of the Jordanian Palestinian Orthodox Episcopal Vicariate in America. Thanks to his vision, since last year, a series of annual spiritual conferences of the Jordanian-Palestinian Episcopal Vicariate in America has commenced (THE VICARIATE FOR PALESTINIAN / JORDANIAN CHRISTIAN ORTHODOX COMMUNITIES IN THE USA), which is held every October, as well as the annual Bioethics Conference every March. He participated, gave lectures and speeches in many workshops and conferences in Greece, other European countries and America. Main subjects of these conferences deals mainly with the Islamic-Christian dialogue and coexistence, Orthodox dialogue with other apostolic and non apostolic Christian communities, human rights, freedom and environmental protection, smoking, drugs, Bullying, etc. He participated also in spiritual conferences focused on the teaching and dissemination of the Orthodox faith. A booklet on the life of the Tripartite Archbishop of Didymoticho Nikiforos Archangelis in 2012 (in Greek). A book on the life of St. Elephtherius, Bishop of Elrico 2014 (in Greek). A booklet on the life of St. Raphael, Bishop of Brooklyn (in Greek). He has a weekly corner entitled “Together on the Path” in the Los Angeles newspaper “Al-Akhbar”, which is issued in Los Angeles, California. Bachelor’s degree – National and Kapodistrian University of Athens, School of Theology, “Department of Doctrine”, 2011. Master’s degree – National and Kapodistrian University of Athens, School of Theology, 2014. Thesis: ‘Dialogue and Christian Islamic Presence in the Byzantine Period – from the spread of Islam until the fall of Constantinople in 1453’. PhD – Doctorate in Psychology, 2016. Thesis: ‘How to support, psychologically and spiritually, patients of cancer and patients of Intensive Care Units and their families’. He is currently completing his scientific career to receive his second doctorate PhD title from The Open University of Switzerland, in collaboration with the University of Dąbrowa Górnicza, Poland, and the Taras Shevchenko National University of Kyiv. The title of his thesis will be “Asceticism as a way, a manner of life, and its consequences on human life (from a theological and philosophical point of view). A tribute from “Peace River Jordan” for his efforts in the spiritual service of Orthodox citizens in America 2016. The Shield of the Jordanian-American Club of Southern California in 2016. The Necklace of St. Paul, of the Archdiocese of Veria in Greece in 2015. The Cross of St. Mark of Alexandria Patriarchate in 2014.